This case was designed for the Bubble Group as a portable entertainment center. 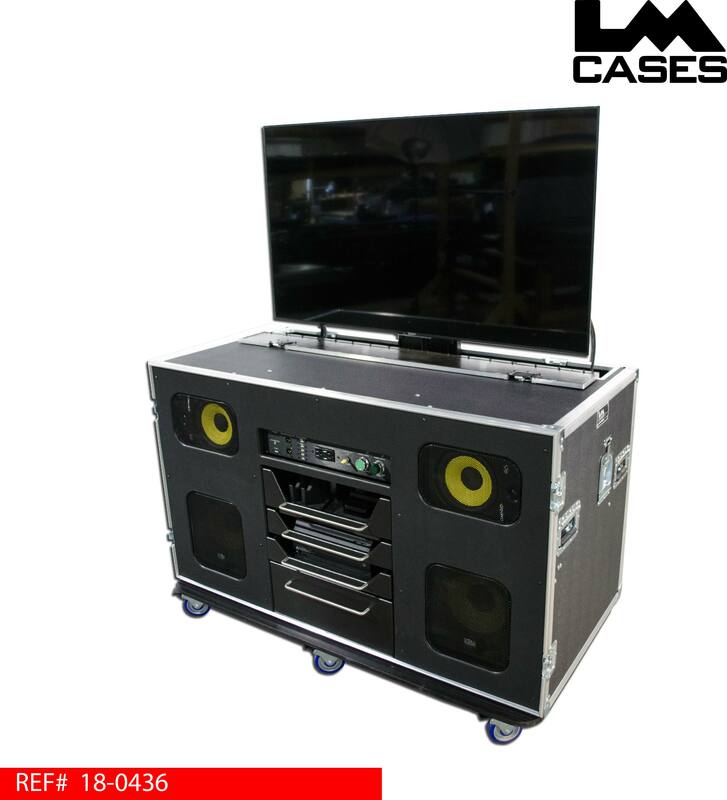 The case comes fully integrated with a 55” Sony smart monitor, Xbox One, PlayStation 4, Apple TV, courtesy charging USB power outlets and a digitally controlled full range audio system. The 55” Sony monitor is mounted on an electric lift that can either be operated by remote control or via a toggle switch mounted in the central control panel. 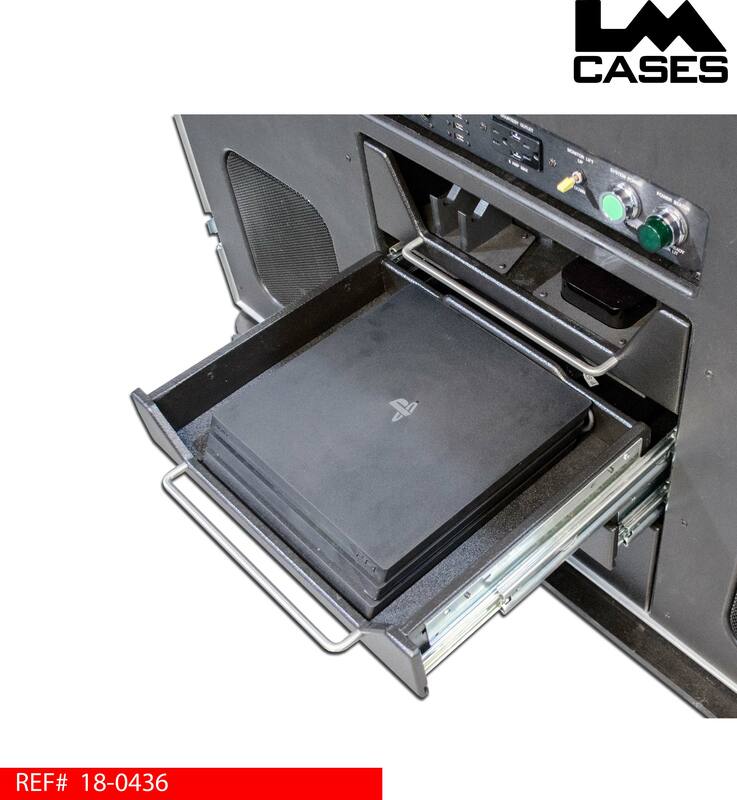 The PlayStation 4 and Xbox One gaming consoles are mounted in individual drawers with vented bottoms. The controllers are held in custom built individual cradles. The controllers and Apple TV are mounted in the top drawer. Each item from the controllers to the gaming consoles are held in custom CNC cut interface brackets. Each of these brackets act as a mounting mechanism for each component allowing the units to be mounted firmly. 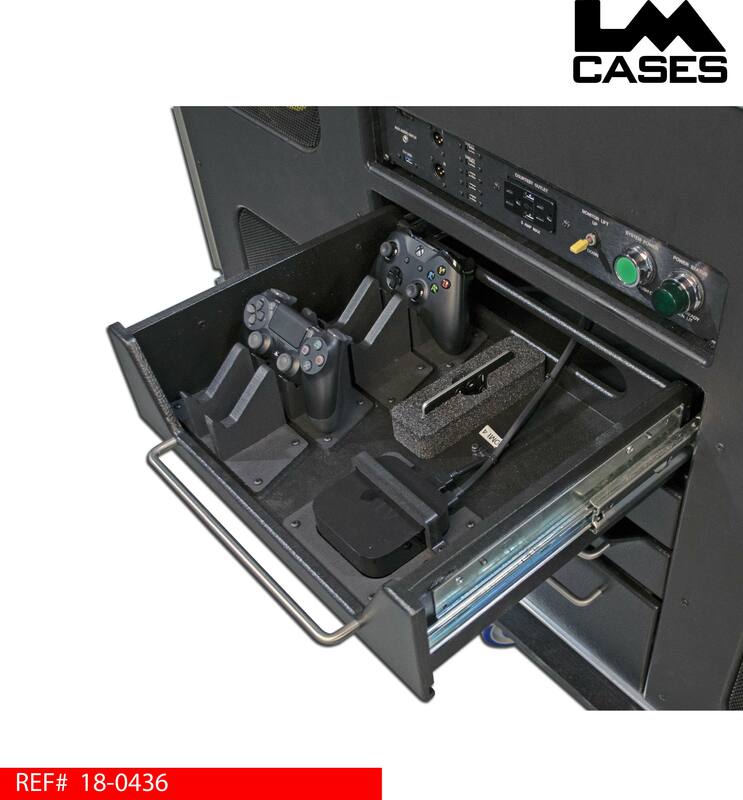 An open storage drawer is located at the bottom of the case to hold the main power cable, component remote controls and misc. accessories. The drawers are built out of ½” Baltic Birch plywood, black texture coated and mounted on HD Accuride glides. Each of the drawers is outfitted with a modern long bar pull handle. The case features a ½” marine grade plastic front fascia panel to hide foam and other inner components from view. 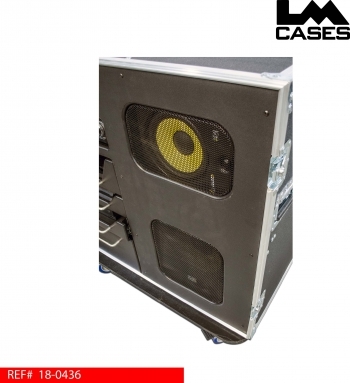 The front fascia includes pressed black perforated expanded metal grills over all 4 speakers. The expanded metal was bent around a die allowing a rounded finished look. The case features a KRK full range audio system complete with 2 – 8” woofer/tweeter studio monitors and 2 – 10” subwoofers. The audio system is time aligned and equalized for optimum performance. Audio limiters are employed on each of the 4 outputs (1 for each speaker) to ensure long term reliability and prevent damage to the system. The main audio output signal is also sent to a XLR pair located in the central control panel, allowing the stereo signal to be sent to a larger audio system if a event should require it. The XLR audio jacks are transformer isolated allowing a noise free output signal. 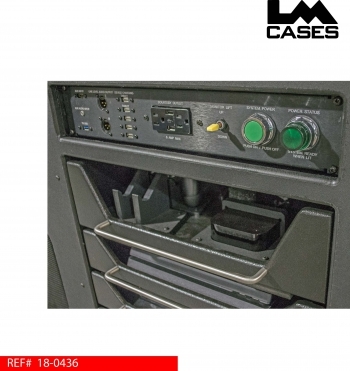 All cabling in the system was custom built with shielded cable, custom heat shrink labels, and Neutrik connectors. Each individual signal and power cable features a heat shrink label at both ends for easy identification. The case features a custom built 2RU control panel allowing a central location for all input connections to the system. Additional details on the panel can be found by clicking HERE. The panel provides a HDMI video input, 3.5mm audio input and a USB 3.0 data input. It also provides a courtesy power outlet and 7 USB charging outlets. System power is routed through a central power sequencing system, allowing each of the components to be powered on and off in a specific order to prevent damage, or “popping” the speakers. The power sequence is initiated via a large green Siemens 30mm push button located on the control panel. Once the system has completed its power sequence, a matching Siemens green indicator light illuminates. Mains power is brought into the case via a custom built power inlet box with a Hubbell inlet. A 25’ – 12AWG HD power cord with Hubbell connectors was constructed and included with the case. 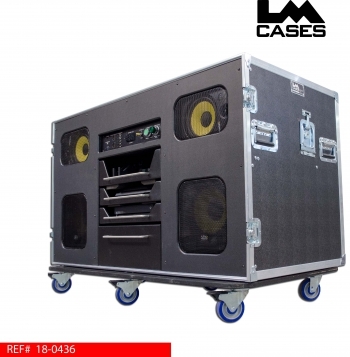 The components in this case were specified and installed by the LM Cases Custom Integration department. 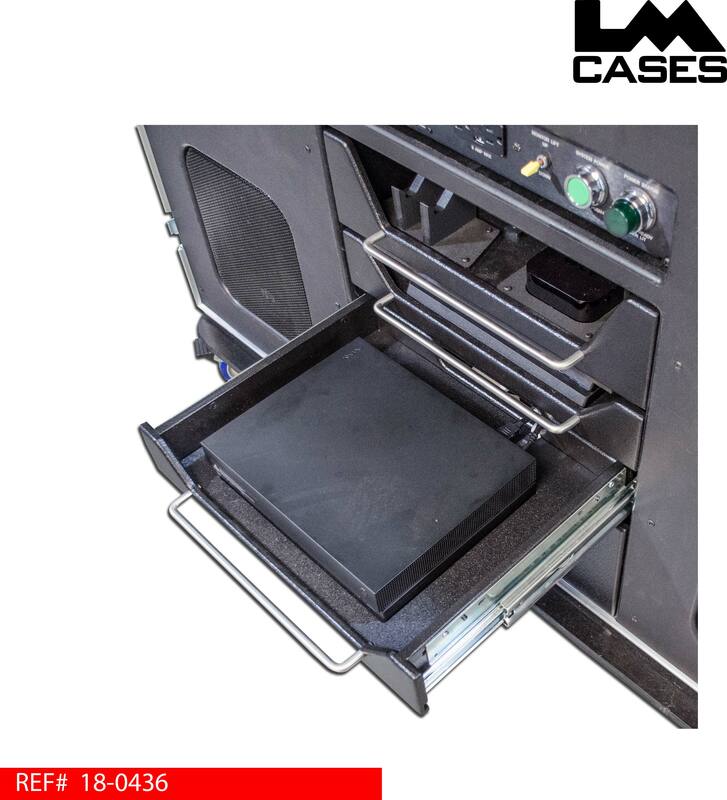 The exterior case is built out of 3/8” plywood laminated with black ABS plastic. The case features recessed hardware, a trap door over the monitor, and 4” casters. Special thanks to the Bubble Group for a great project!